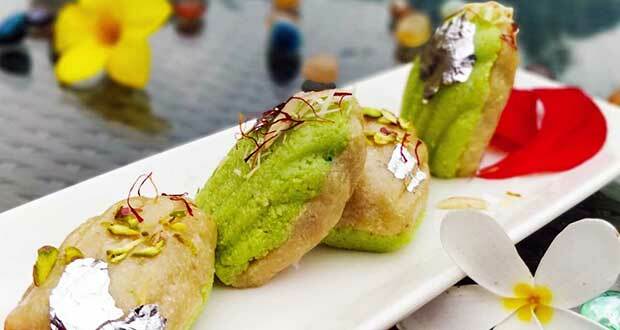 About Barfi Modak Recipe: A festive special recipe, Modak is a sweet flour dumplings stuffed with nuts and dry fruits. A popular Maharashtrian dish, it is usually made as a prasad during the festival of Ganesh Chaturthi. This modak recipe has all the ingredients cooked with kaju paste and filled inside modak moulds, served with garnishing of silver varq. 1.Fry kaju paste in ghee. 2.Now add khoya along with milk and cook until its thick. 3.Add sugar, dry fruits and kesar. 4.Put it inside a modak mould and set it in chiller for one hour. 5.Once it is set, serve it in a plate and garnish it with silver varq, pista, almond and kesar. Wow ! so delicious . Such a lovely dish ! A very easy recipe ! Excellent recipe with great flavors !